Exactly 270 electoral votes are needed to win the presidency. CBS News estimates Obama can count on 212 and Romney can rely on 191. CBS News political director John Dickerson reports on the battle for the 135 up for grabs. (CBS News) Amid ever-tightening presidential polls and reports of a tepid fiscal recovery, President Obama and Mitt Romney both head to Ohio Thursday to deliver dueling remarks about the economy -- each candidate attempting to sell his fiscal vision to voters as America's most promising path toward renewed prosperity. 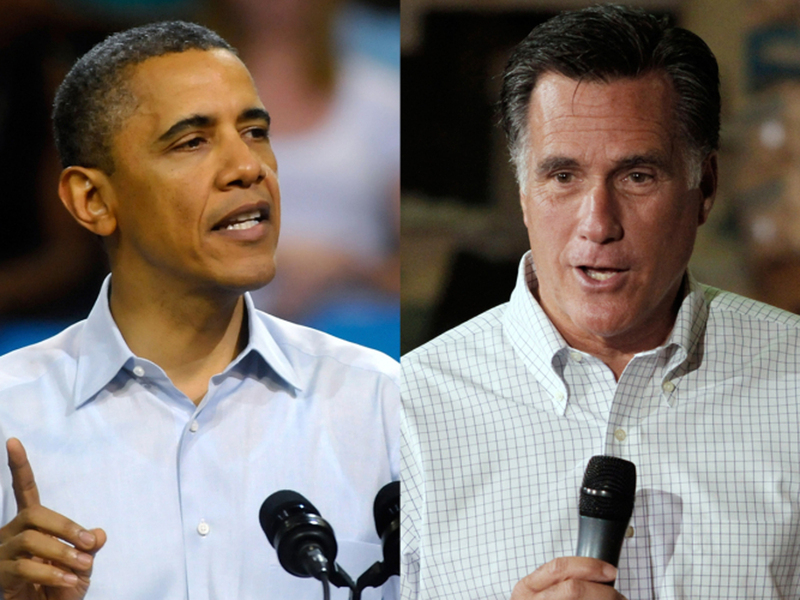 Taking place about 250 miles apart -- Mr. Obama in Cleveland, Romney in Cincinnati -- in a state widely considered one of the most crucial battleground territories in the country, the two speeches mark the first time this cycle that both candidates will speak on same day out of the same state. Already, the gloves are coming off. In remarks to reporters on Wednesday, Romney pre-butted Mr. Obama's Thursday remarks, predicting that the president will use the speech as an opportunity to "change course" after failing to win over voters with his previous line of persuasion. "[Mr. Obama] said, as you know, just a few days ago, that the private sector is doing fine, but the... the incredulity that came screaming back from the American people, I think, has caused him to rethink that," Romney said, prior to a gathering of the Business Roundtable Association in Washington, D.C. "I think you're gonna see him change course when he speaks tomorrow, where he will acknowledge that it isn't going so well, and he'll be asking for four more years." "My own view is that he will speak eloquently, but that words are cheap, and that the record of an individual is the basis upon which you determine whether they should continue to hold on to their job," he continued. Romney's campaign, meanwhile, held a call with reporters to address his -- and Mr. Obama's -- Thursday speeches. "What I think you're gonna see tomorrow from the president is just more of the same," said Russ Schriefer, senior adviser to the Romney campaign, in the call. "No real ideas on how to get the economy going... No real new proposals." In contrast, he argued, Romney would be outlining a series of "very, very specific" plans. Meanwhile, Mr. Obama, who will be speaking at a community college in Cleveland, plans to draw stark distinctions between his own economic philosophy and that of his rival while underscoring the dire economic circumstances he inherited in 2008. "This election offers the American people a chance to break the stalemate between two fundamentally different visions of how to grow the economy, create middle-class jobs, and pay down the debt," an Obama campaign official said in a statement. "Governor Romney and his allies in Congress believe that if you simply take away regulations and cut taxes by trillions of dollars, the market will solve all our problems on its own." "The President believes the economy grows not from the top down, but from the middle class up, and he has an economic plan to do that -- a plan that focuses on education, energy, innovation, infrastructure, and a tax code that creates American jobs and pays down our debt in a way that's balanced," the Obama campaign official continued. In Wednesday's press briefing, White House spokesperson Jay Carney argued that the president was determined to dig the country out of "the worst economic cataclysm of our time" -- but that it had been a situation he had inherited. "What we all know is that this country has been through the worst economic cataclysm of our lifetimes. That is what was taking place in 2008 when the last election happened and in January 2009 when President Obama was sworn into office," Carney told reporters. "Stopping that cataclysmic economic slide, that decline, reversing it, and beginning to climb out of the hole that the recession dug for this nation has been the principal mission of this president and this administration." According to Professor Paul Beck, a professor of political science at Ohio State Univeristy, tomorrow's showdown is a mere precursor of what's to come in Ohio in the coming months. Recent polls suggest that Mr. Obama and Romney are neck-and-neck in Ohio, and outside money has already flooded the state. "Romney and Obama are going to be back to Ohio a lot during the campaign. They're running ads, they're building organizations," Beck said. "We're in a stage where candidates are going to try various lines out to see what works and what doesn't work. Then they'll leave behind what doesn't work." Of crucial importance, he says, is the question of whether or not Mr. Obama is able to build support among white middle-class male moderates in the state. "There has been resistance to Obama among some traditional working class Democrats," said Beck, noting that Hillary Clinton did particularly well among that demographic in 2008. In addition to a tendency toward conservative attitudes with regard to social policy, he said, "there probably is racial prejudice" at play as well. But, he argues, Romney also struggles with that group, which tends to be sympathetic toward Obama campaign arguments regarding Romney's record at Bain and his position on the auto industry bailout. "What you'll see the Obama campaign doing is really pounding hard on this theme that Romney doesn't really understand them -- that he is very rich, very privileged, and that he doesn't understand the plight of the ordinary worker," said Beck. "I think with that demographic it could work." Months out from the election, amid continued economic uncertainty both in America and abroad, it's impossible to say which way the electoral tides will turn come November. But both sides are making it indisputably clear that they'll do whatever they can to win over voters in the state. Asked about internal tensions within the Ohio GOP, Schriefer emphasized that Republican forces are "united to make sure that we win in November. And to do whatever they need to do in terms of turning out the vote, making sure that phone calls get done, yard signs get put up, and we have a great Ohio campaign." "I think that there is no state that is more important than Ohio," he said. "And that we are counting on them to do their best and we know they will."